6524 – This simple sheath dress comes with several sleeve options. Very consistent with the sleeve trends we’ve seen this year, though much less voluminous than what we had during summer. 6525 – Another dress that is using the ruffle trend to give it some interest. 6526 – This is a pretty, classic party dress. Nothing new here, but it does have some nice bodice and skirt options. Love the use of the print on the model. 6527 – Tops with sleeve options. I actually like a lot of the variants here; I think these could look very pretty in a nicely draping rayon. 6528 – More sleeve ruffles, but a bit more fitted. This could be a good fitted woven t-shirt pattern without the embellishments. 6529 – I really love this as lazy day loungewear. It’s the sort of thing I’d want to snuggle in on a rainy, cold day. 6530 – The hem contrast keeps this from being too simple. I like the tops; the skirts and pants are generic, but that could be good for a wardrobe. 6533 – More ruffles and leggings. Depending on fabric choice, this could work well for spring too. 6532 – I do like the top and pants in this wardrobe set; they make great layering pieces. The jacket is a bit too voluminous for me, but I do like the lines of it. 6534 – That is one dramatic collar! These coats look pretty simple to construct, while still having a fair number of details; they’d be great for fall. 6535 – I sort of want this pattern, but to make costumes, not regular clothes. 6536 – More coats/vests. I’m not liking these as well as the other options, but the raglan sleeves are a nice feature. 6537 – Kids PJs. That’s pretty much all I’ve got to say for this one. 6458 – More kids clothes. Looks like they are incorporating the ruffles a bit here. 6539 – Kid’s skirt. Nothing too exciting, but it does also include the pattern for the cat ear headband – possibly a selling point? And that’s it. Nothing really standing out for me here, but I’m also not overly into the recent trends of boxy silhouettes and excessive ruffles. What do you all think? 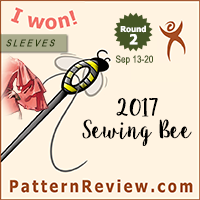 See anything that makes you want to get started on fall sewing? Or does this collection feel like a lot of pieces that would play supporting roles in a wardrobe? Feel free to discuss in the comments! 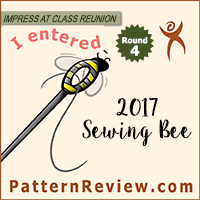 Pattern Review Sewing Bee – I’m In! There is a New Look Labor Day sale at Simplicity.com. 99 cent New Look patterns. Code: 99NEWLOOK I think it goes til Sept 3rd. Free ship over $75 if you want to get aggressive. I have 3 on the way to me: 6534, 6530 & 6532. I thought it was a solid collection for New Look. Those will look really cute on you! Like you said, a lot on the bland side this time. But certainly not ugly. Had nearly all the same patterns in my cart last night (10 patterns), but they wanted $31 to ship them to Canada. Not happening. But if you are in the US, definitely take advantage of the great sale this weekend. Loving the lazy jumper, I fancy trying a hoodie this winter. I also really like the cape style coat. thanks for another great round up.